The Government has been getting some criticism recently for its rollout of Project Ireland 2040. In large part this is due to the use of 'advertorials' to shape coverage of the plan in local and national media, in a way that was seen to go beyond acceptable public information campaigns. Such campaigns have an important role to play - they can bring useful, and important, information to the attention of members of the public, and can even promote governmental goals, in cases such as public health campaigns. The 2040 campaign, though, was leveraged to promote those 'announcements' by government TDs and senators with whom we are all too familiar: "I'm glad the Minister for X, and the Government, have listened to my lobbying, and are building something in my constituency as part of the State's strategic plans." It is fascinating how often in Ireland, strategic planning seems to lead to exactly the partisan results it was felt necessary to engage government representatives in lobbying for, and how leaks of 'expected outcomes' from the cabinet meeting were strategically timed, to provide advance attention, to local politicians who could claim both insider information and credit for the (successful ) decisions. Michael D Higgins is just one of those to draw attention to the unhealthy nature of 'gombeen politics' and clientelism from the 1970s onward. Whether or not decisions have actually been made on the basis of local political considerations, the fact is the Government, Government TDs, and senators, are anxious to give the impression that such decisions are, is a corruption of public debate. So the problem is wider than the advertorials - it is about the type of politics we present ourselves as having. The content of the plan itself shows just how much the focus is on spin and 'message' over substance. First, and a basic stumbling block for Insider, is the title. The project, launched in 2018, talks about what Ireland will look like in 20 years - that's 2038, not 2040. If you are out by 10 per cent in your very title, what else can you not trust? Within the project document, various goals are actually on timelines to 2030, 2050. To make it worse, the two actual plans which make up the practical announcements within the 'project' - the financial commitments and projections - both run to 2027. Clearly Project Ireland: 2027 sounded too much like a dystopian sci-fi flick. There are some laudable goals hinted at in the plan - more geographically-balanced growth, tackling "continual expansion and sprawl of cities and towns out into the countryside". Yet the numbers (such as they are ) that underpin this highlight show how modest these commitments are. Alongside recognition of the harmful environmental impact of urban sprawl, we get a target that 60 per cent of new housing will consist of sprawl outside of existing urban footprints, and continued ribbon development in rural areas. Only 40 per cent of housing will be 'within or close to' existing built-up areas. However Insider admits, at least, to feeling challenged by the exercise. There is a grandiosity to the title (unfortunately belied by much of the vision ). On a local level, what might we hope for in a Project Galway: 2040? Or even Project Galway: 2023? The project envisages a growth of 50 per cent in cities like Galway by 2040, half within the city's footprint, and half (presumably ) as sprawl and expansion of the city - an extra 45,000 people, bringing our population to at least 120,000. This means that, in addition to the Ardaun plan - which envisages a population somewhere under 10,000 within the next 10 years - we will need several other projects of similar size. With the Ardaun project lacking concrete targets for rollout in its most recent versions, Insider must admit scepticism regarding our ability to deliver balanced development that meets our social needs, but lives in hope. The rental crisis in the city shows few signs of diminishing, and property agents are boasting about the increases in sale prices. Our demographic make-up is ever more varied, with a variety of needs that must be reflected in active management of housing provision. Will the city adequately prioritise the needs of those with disabilities - something that is now city policy thanks to Labour city councillor Billy Cameron? Will the needs of the Traveller community be met, or will we continue to punt on that issue? Will the needs of the elderly, those living alone, and the student population (many now commuting from other counties, such is the shortage of suitable accommodation ), be reflected in new housing and services? Will, as Cllr Niall McNelis has advocated, regulations be put in place to clamp down on the unapproved conversion of residential properties to long-term usage for Air B'n'B and similar holiday letting services? With such challenging projections for growth - 45,000 people is more than the entire population of the city when Insider was growing up in the 'fastest growing city in Europe'! - the obvious existing needs of the city (beyond the thousand extra houses needed each year ) will become even more glaring. Insider is not the only one to notice most of our local secondary schools bursting at the seams. Continued year-on-year growth, driven not only by population growth in the city, but significant numbers of students commuting in from outside the city's official school catchment area, mean that by 2019 the number of pupils in the city will exceed the capacity of existing schools, including the newest schools, those opened by GRETB in recent years. Stalwart local groups like the Galway Educate Together Second-Level Startup Group, have been bringing these demographic challenges to the attention of the minister and local politicians over a significant period of time. Insider is confident that they are finally being heard, and that Galway will gain at least one new school in the upcoming mid-term review of second-level school capacity - indeed, the projected population growth for the city should see an extra 1,000 student school places announced every five years through to 2040. Recent school competitions have stressed parental demand and diversity in comparison to existing provision. With Galway the only city in Ireland without a second-level Educate Together school (despite multiple schools at primary level ), and with GRETB having opened the two newest schools in Galway (Merlin College and Coláiste Bhaile Chláir ), Insider's prediction would be for Educate Together to be successful in its bid, once the competition is announced. For a city that prides itself on its culture, and depends so much on tourism, there are significant areas that need attention and development. One of the more significant elements, for Insider, of our 2020 bid was the feedback on the draft bid that Galway lacked appropriate infrastructure. So much of what has been developed here has depended on the force of individual personalities, on building first and hoping sustainability will follow. As the city gets bigger, and the stakes higher, that approach - be it in the arts, or education, or public amenities - becomes more difficult to justify. We need the formal systems that manage and oversee a coherent, sophisticated, cultural sector. We need a city library that reflects our ambition to truly be Ireland's cultural capital. 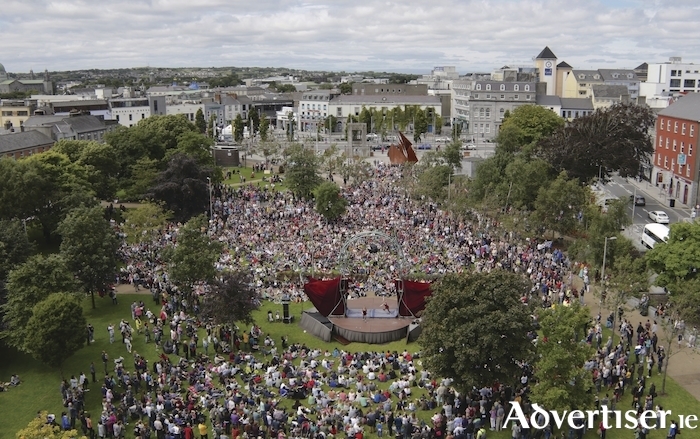 Taking all that together, let Insider say: Project Galway 2027 - it is worth fighting for.